With a 3-0 start, the Buffalo Bills seem to be pointing in the right direction to start the 2011 season. Considering that each team has posted only one winning season since 2000, dual 3-0 starts by the Buffalo Bills and Detroit Lions has the NFL turned upside down and fans in both cities celebrating like it is 1980 all over again. Indeed, it was 31 years ago that both franchises started the season with perfect records during the first month of the season to become the darlings of the NFL. The NFL was a little different back in 1980 as both teams relied on rookie running backs to spark their team. The Bills featured former Auburn Tiger Joe Cribbs while the Lions had a budding star in former Heisman Trophy winner Billy Simms. Of course as we fast forward to 2011 the focus is no longer on the running game, though solid runners have helped both teams to their early starts. The focus in today’s NFL is on the passing game and the Bills and Lions rely on Ryan Fitzpatrick and Matt Stafford much more than the 1980 squads relied on their starting quarterbacks Joe Ferguson and Gary Danielson. Entering the 1980 season, both the Lions and Bills were coming off four straight losing seasons. Following a 2-14 campaign in 1979, the Lions drafted Sims with the first pick in the NFL draft. Under third year head coach Monte Clark, the team won their first four games in dominating fashion. They outscored the Los Angeles Rams 41-20 and then combined an explosive offense with a dominating defense to allow their opponents seven points each in the next three games as they outscored the Packers, Cardinals and Vikings 76-21. 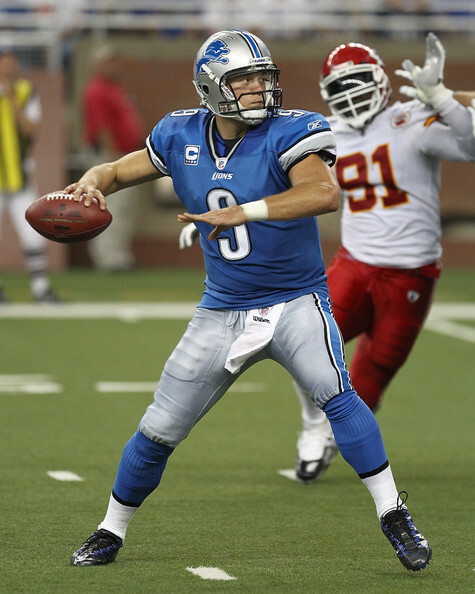 Unfortunately, the Lions couldn’t maintain the momentum and finished just out of the playoffs with a 9-7 record. However, the winning season was their first since 1972 and started a four year stretch in which the Lions posted a 30-27 record and twice advanced to the playoffs. 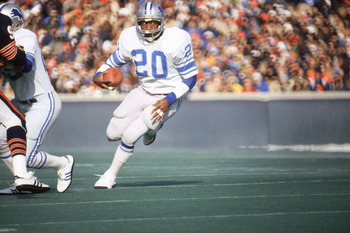 After the Detroit Lions won only two games in 1979, rookie Billy Sims helped lead them to four straight wins to start the 1980 season. That stretch coincided with the four full seasons of Sims as the feature back for the Lions. As a rookie, Sims rushed for 1,301 yards and 13 touchdowns to earn NFL Rookie of the Year honors. Between 1980 and 1983, Sims posted three 1,000+ seasons (639 yards in nine games during the 1982 strike season) and was on his way to a fourth when he suffered a career ending knee injury in the eighth game of the 1984 campaign. The 1980 season was the third campaign in Buffalo for former Rams coach Chuck Knox and the Bills had seen improvement each season. After posting 2-12 and 3-11 campaigns in 1976 and 1977, they had improved to 5-11 in 1978 and 7-9 in 1979. The addition of Cribbs, as a second round selection, proved to be just what the “Ground Chuck” offense needed as the rookie rushed for 1,185 yards and caught passes for another 415. However, the strength of the Bills in 1980 was the defense as they allowed the third fewest points in the NFL and had the second best pass defense in the league. After starting the 1980 season with five straight wins, the Bills lost three of their next four games, but rebounded to win five of their final seven games and claim the AFC East title. They lost to the San Diego Chargers 20-14 in the opening round of the playoffs. 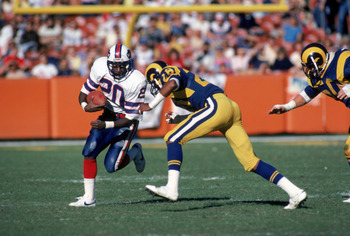 The Bills reached the playoffs again in 1981 with a 10-6 record and advanced to the second round of the playoffs before losing to the Cincinnati Bengals. Knox left for Seattle following the 1982 season and Cribbs left the team for the 1984 season to play in the USFL. Rookie Joe Cribbs helped the Buffalo Bills to five straight wins to start the 1980 campaign. Given the struggles of both squads over the last decade, the 3-0 starts in 2011 are certainly a welcome change. 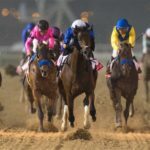 Both teams are unquestionably better this season than in recent years, but it will be a challenge for both teams to propel their quick starts into playoff trips. Though they had an answer for every New England punch in their shocking 34-31 victory over the Patriots, the Bills have quite a schedule in front of them before they complete the season with the rematch in Foxboro on January 1st. Buffalo will look to remain undefeated next Sunday at Cincinnati before embarking on a tough five game stretch where they host the Eagles, Redskins and Jets while playing on the road against the New York Giants and Dallas Cowboys. 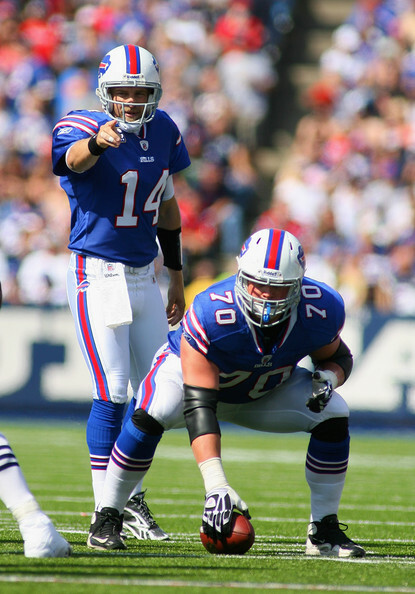 Unlike the defensive oriented 1980 Bills, the 2011 version of the Bills appears to be relying on their offense to out-score opponents. Though they did hold Kansas City to seven points in the opener, the Bills have surrendered 35 and 31 points, respectively, the last two weeks, but have been able to muster 38 and 34 points to pull out the victories. Even with Fitzpatrick, running back Fred Jackson and receiver Steve Johnson putting up big numbers, it doesn’t seem likely that the Bills will be able to continue scoring 38 points per contest. The defense did disrupt Tom Brady enough to pick off four passes, but they must get consistent defensive play if they hope to reach the playoffs for the first time since 1999. In just his third season, Matt Stafford is showing that when healthy he can be an elite NFL quarterback. For the Lions, the 3-0 start shows just how far the team has come since posting a 0-16 record in 2008 and winning just two games in 2009. Unlike earlier in the decade, the Lions have done a good job in recent years stocking their lineup with young stars and players capable of leading the Lions to long-term success. Former first round picks Stafford, Calvin Johnson and Ndamukong Suh all seem to have the talent to become regular Pro Bowl performers. The biggest question for Stafford is not whether he can be an elite quarterback, but if he can remain healthy. If he can, then the Lions may be close to contending with the Bears and Packers in the NFC North. It won’t be long before the Lions find out if they have what it takes to contend. After playing at Dallas next week, they host Chicago, San Francisco and Atlanta in consecutive weeks. Later in the season they play at Chicago, New Orleans and Oakland and have two games against the defending Super Bowl Champion Packers. It is certainly too early to pencil either the Bills or Lions in the playoffs, but with starts reminiscent of the 1980 campaign, both teams seem headed in the right direction.